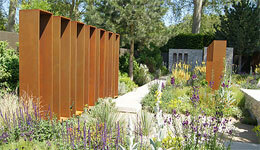 Andy Sturgeon took ‘Best in Show’ at the 2010 RHS Chelsea Flower show with his contemporary dry climate garden. The gold medal winning Daily Telegraph Garden by Andy Sturgeon has a tidy contemporary feel with pathways leading through different areas of shrubs, herbaceous plants, seated areas and architectural structure. Although the garden has a modern feel, the pale gravel and sectioned areas provide a sense of space but this does not come at the cost of planting, as so many modern gardens do. Richly planted areas feature perennials and shrubs which can easily provide arms full of cut flowers and foliage. This idea can easily be scaled to suit the average garden and the architectural aspect can be kept by replacing the metal structures with tall cypress, like those found in Italian landscapes. RHS Chelsea – Video tour of Andy Sturgeon’s “best in show” garden.